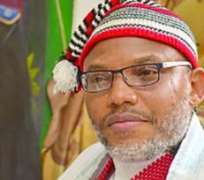 Spokesperson of the Indigenous Peoples of Biafra, (IPOD), Mr Nnamdi Kanu has expressed regret that he attacked Yoruba people in widely circulated video posted some three years ago. The hate clip has continued to draw reprimand and outright rage among the Yoruba who potentially should be his ally. Irohinoodua obtained a piece by Paul Njoku this evening saying the IPOD leader is deeply sorry about the speech he made three years ago which seems to have compounded public perception of him in the South West. The Igbo has a huge population in the South West and the region, at least for half a century, has been home to many successful Igbo tycoons. Njoku met Kanu in his country home and released the statement after the meeting. Mr Njoku said “I just finished having a private meeting with Nnamdi Kanu now and he has confidently told me that he has withdrawn all his remarks against the Yoruba today. He publicly affirmed his loyalty and great respect for the Afenifere and the Yoruba in general’ Njoku said. He added that Mr Kanu did not mean to hurt the Yoruba nation and that his utterances made three years ago were aimed at stirring the people of the South West so that they could rise up in pursuant of the self-determination campaign. Njoku said “ He has asked me to quote him. He did not mean to hurt the Yoruba people. He has a lot of respect for the Yoruba people.” He added “Therefore, you can pick it from here and quote me that Nnamdi Kanu has renounced and denounced his previous views against the Yoruba. He has addressed the press. He also supports and calls for the self determination of the Yoruba.” He said that Kanu will speak more on his apology during his proposed visit to Lagos any moment from now.